Spiros Soutsos was born in Thessaloniki, Greece. He was taught portrait and cinematographic poster art by his father Kostas Soutsos, who worked as a movie giant-poster designer in the early 1960’s in kozani and Thessaloniki. Even since his childhood, Spiros used to depict art themes that made strong impression on him, and were particularly dominated by the human element, first by sketching on paper and later by painting with watercolour and gouache. 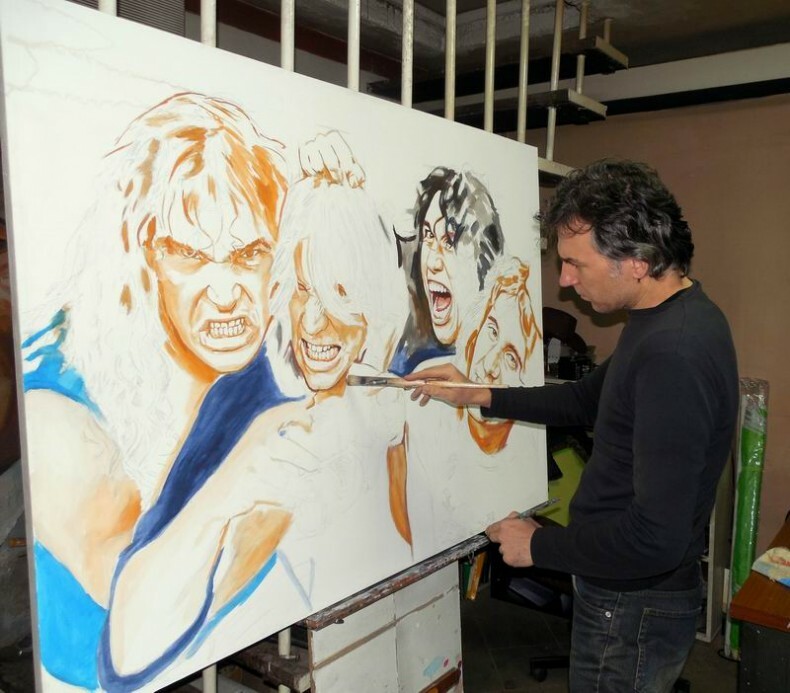 Inspired by Italian Renaissance, Baroque and Comics Pop-Art style, he started to create replicas of the Old-masters’ paintings such as Michelangelo, Peter Paul Rubens and Eugène Delacroix, and reproduce drawings of famous Comics illustrators, such as John Buscema (Conan the Barbarian) and Greek artist Spiros Ornerakis. He was also enchanted by the “epic” painters of the 1970’s, Frank Frazetta and Boris Vallejo, with their amazing heroic-fantasy art. But undoubtedly, his greatest influence is the film poster art, due to his huge love for the classic cinema. He is a cinemagoer and a cult and classic film collector. Film-Noir, Western, Nouvelle Vague, Gothic Horror, Comedia all’ Italiana are some of his favourite film genres, as he is a fan of great film-makers such as Sergio Leone, Jean-Pierre Melville, François Truffaut, Henri-George Clouzot, Vittorio De Sica, Howard Hawks etc. He is fascinated by the golden age of cinema, where its films even though had a commercial character, were works of fine style and artistic value, as were produced by great directors and featuring brilliant star-actors, in contrary with the contemporary cinematographic industry where the actors-protagonists are replaced today by special effects. The history of this classic era of cinema is reflected by the extraordinary and captivating movie-posters that were produced. Designed by high-talented painters, these posters were full of expressiveness and power many of which are classic and acclaimed masterpieces. They can not be compared with the cold and soulless Photoshop film posters of our times. So inevitably, Spiros turned his interest in the giant-poster technique. He started to study works of his father Kostas Soutsos ( a fanatic cine-goer too). His father gave him invaluable technical instructions about portraiture and taught him the painted film-poster technique as well as the usage of acrylic paints. But besides his father work, Spiros Soutsos has been deeply influenced by the most brilliant Italian poster designers, such as Averaldo Ciriello, Angelo Cesselon and Renato Casaro. 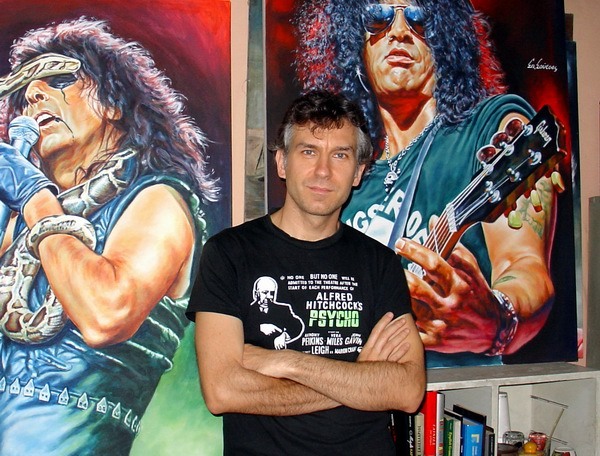 The mixture of these influences has a special result in his painting style. In all his artwork we meet the “marriage” of realism with the movie-poster art-style. His art is full of expressiveness and is characterised by vivid colors reminiscent of the “technicolor”, the classic-cinema color system. He resides and works in Thessaloniki, Greece and many of his works are placed in several private collections all around the world.